Despite being dismissed by filmmaker/lead actor and uncredited screenwriter Orson Welles as his least favorite cinematic creation, 1946's The Stranger – released just five years after his undisputed masterpiece Citizen Kane – wound up becoming the auteur's only profitable picture during its theatrical run. Today’s audiences, however, don’t seem to share the same enthusiasm as the underrated Stranger is repeatedly overshadowed by obvious favorites including Welles's groundbreaking directorial triumphs Citizen Kane and Touch of Evil along with his iconic performance in The Third Man . Yet having recently viewed the brand new crisp Blu-ray release of The Stranger for the first time in more than a decade and just five months after taking in director Carol Reed’s landmark production of The Third Man in the same high definition format, I can’t help but reevaluate The Stranger . Although transferred from the original 35mm elements and debuting as a Blu-ray/DVD combo pack complete with a gorgeous replica of the vintage lobby postcard art included inside as a keepsake, on the surface Film Chest Inc.’s release of The Stranger may appear more modest than the bells-and-whistles Criterion modeled approach taken by Lionsgate’s Studio Canal Collection for The Third Man Blu-ray back in September. But fortunately for Welles collectors, the visual and audio quality of this Blu-ray disc is light-years ahead of Lionsgate's disappointingly muddied Third Man presentation that suffered from a nearly incomprehensible soundtrack. 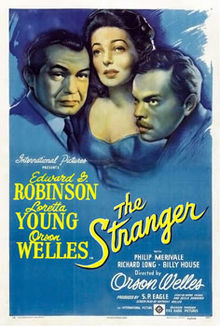 The first film after the Second World War to feature footage of the atrocities that occurred inside the concentration camps, Welles’s Stranger is a thriller with a conscience that likewise takes a cautious and downright pessimistic view of the future of Germany, which must have been quite shocking for its time. A boldly unconventional work of film noir masquerading as a war themed suspense picture, The Stranger begins as U.N. Nazi hunter Mr. Wilson (Edward G. Robinson) releases one “fish” in the hopes of reeling in an even bigger one in the form of an as-yet-unseen, unidentifiable “stranger” Franz Kindler who has been as diabolically successful in evading capture as he was in masterminding acts of unspeakable genocide. Similar to the way that Kindler has left all traces of his old life behind him – in a brilliant act of artistic symbolism – Welles likewise dispatches with all of the obvious signposting of traditional film noir to keep us off-balance and ill-at-ease with the realization that the events unfolding onscreen could just as well occur in our own backyard. In doing so, Welles replaces the rain-drenched big city streets and shady underworld characters that lurk in the shadows with a seemingly idyllic sun-drenched, small town USA setting wherein the smiling faces of some of the town’s newest residents cast dangerous shadows and forecast the suspense to come when we ascertain that Kindler is hiding in plain sight in his new role as schoolteacher Charles Rankin (Welles). And as if the idea of a Nazi molding the minds of America’s young wasn’t disturbing enough, the screenwriters raise the stakes of horrific urgency even more upon discovering that on the very day that Wilson and Kindler’s associate arrive to unmask the war criminal, Rankin is slated to be married to town beauty Mary (Loretta Young), who just so happens to be the daughter of a Supreme Court Justice. Once Wilson’s “fish” vanishes, The Stranger evolves, moving from a cat-and-mouse thriller into a superbly taut chess match played by the subtle Wilson and increasingly paranoid Kindler/Rankin as each man tries to anticipate the move of the other and figure out a way to outwit their opponent before more residents – including his new bride – disappear for good into the shadows of Rankin’s deceitful smile. And speaking of shadows, it’s hard for fans of The Third Man not to appreciate the moodily atmospheric use of shadows that nearly bookend the work from the European war crime chase at the start to a Hitchcockian clock tower showdown that brings the film’s overall pursuit to a close. Of course Welles’s passion for both clocks (of the cuckoo rather than tower variety!) and shadows would return in a more significant way in Reed’s Third Man , with Welles being more responsible for the former than the latter by having written the instantly memorable “cuckoo clock” speech. Nonetheless, The Stranger does serve as an ideal lead-in or companion piece to Reed’s classic. Likewise, given Welles’s unusual experimentation with film noir genre artistry in this film, in my eyes (and in retrospect) I'd go even further in assessing its importance in his career. In addition to the way that the intelligent, little-seen Stranger seems to serve as both a vital cinematic precursor to The Third Man, his penchant for playing with noir (via Stranger and others) eventually came full circle in the '58 production that many consider to be American cinema's last bona fide film noir -- Orson Welles's Touch of Evil . Thus, Welles's least favorite picture is the one most deserving of another look so go ahead and let this Stranger into your home.